The Cannabis Sector after the Vote – Boom or Bust?? In attempting to determine the immediate course of the cannabis sector right after the vote, there are two major factors to consider. One is the actual outcome of the vote, and whether it exceeds or fails to meet market expectations and what this will lead to. The other is the heavy buying of the sector ahead of the vote that has caused huge runups in many stocks, making it vulnerable to a wave of profit taking on the vote—especially if it fails to meet expectations. 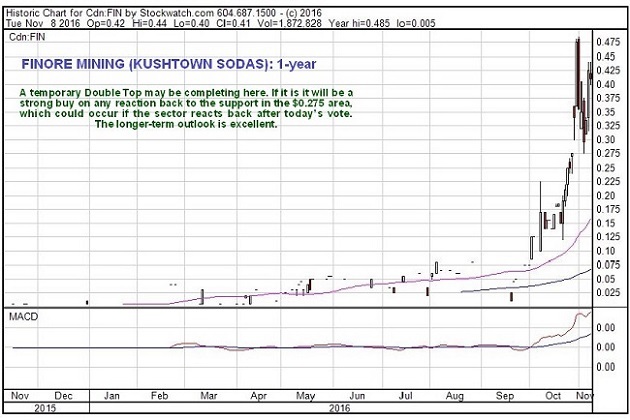 We already made big, and in some cases huge gains as a result of the boom in cannabis stocks over the past month or two, and were in the vanguard of the wave of profit taking across the sector last week, caused by understandable nervousness ahead of the vote. However, it is important to understand that this still very young industry stands on the threshold of a massive boom, which if the vote goes well as expected, will be comparable to the boom in the liquor industry when prohibition was lifted back in the 30's, and the stocks of the best companies will go on to make spectacular gains. So it is now thought that, assuming the vote goes at least as well as expected, any post vote bout of profit taking will be short-lived and followed by a reversal and a strong and sustained rally as this industry booms—and the spreading legalization of cannabis in the US will have a knock-on effect around the world. This is the reason why, after we took profits in many stocks last week, we started rotating back into the best ones on Friday and on Monday. So what tactics should investors and speculators employ at this juncture, especially those who are new on the scene? Firstly, after yesterday's rally, there is so little time left before the outcome of the vote is known that it probably makes sense to wait for the results. Then, if we do see an immediate wave of "sell on the news" profit taking, it will be viewed as throwing up a major buying opportunity, especially if the vote generally meets or exceeds expectations. If a positive vote triggers a wave of buying, this may then be followed by a bout of profit taking that briefly drives prices lower, perhaps quite a lot lower, again providing an opportunity to step up to the plate and buy the better stocks. The key point to keep in mind is that if the vote goes well, especially in California, then we are on the threshold of a massive one-off boom in this sector and fortunes will be made, with the best stocks multiplying in value perhaps 10 or 20 times over the next year or two. 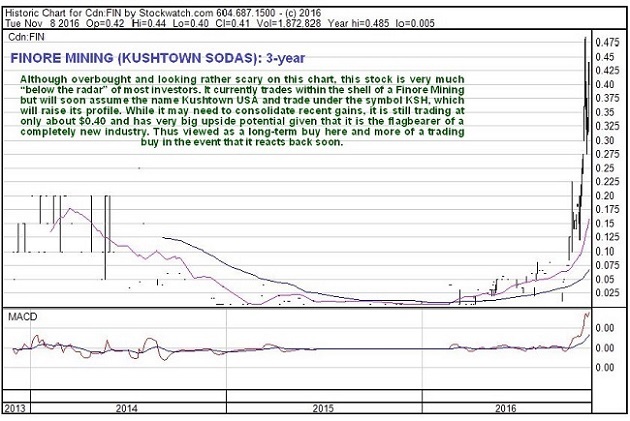 One very interesting stock in the sector that is viewed as having great potential is Kushtown Sodas and Edibles, which manufactures a range of sodas that include a medical marijuana tincture known as Kushtown Tincture, which is reputedly a great remedy for cancer and other ailments. The company is the first and most recognized edible company in the industry, and its products are rapidly growing in popularity. The good thing is that its stock is still below the radar of most investors, one symptom of this being that its stock trades as a shell called Finore Mining (code FIN on the Canadian market), and another being that it is not listed in Stockcharts.com. We can however access its stock chart in Stockwatch.com where we can see that somebody is on to it, as it has risen quite a bit already in recent months. If you want to find out more about this high-growth sector, click here to download our free Green Paper, and if you want to read my strategic insights into the sector, you can subscribe here. Want to read more Streetwise Reports articles like this? Sign up for our free e-newsletter, and you'll learn when new articles have been published. To see recent articles with industry analysts and commentators, visit our Streetwise Interviews page. 1) Clive Maund: I, or members of my immediate household or family, own shares of the following companies mentioned in this article: None. I determined which companies would be included in this article based on my research and understanding of the sector. 3) Statements and opinions expressed are the opinions of Clive Maund and not of Streetwise Reports or its officers. Clive Maund is wholly responsible for the validity of the statements. Streetwise Reports was not involved in the content preparation. Clive Maund was not paid by Streetwise Reports LLC for this article. Streetwise Reports was not paid by the author to publish or syndicate this article.